Digital social networks have become places that we increasingly go in order to stay informed and up-to-date on the top news and best thinking in our industry – whatever that industry is. Of course, journalists and trade media still play an important role, as do business leaders and subject-matter experts, in informing the discussion of relevant issues in any industry, but social networks are becoming the channels through which knowledge and interactions are mediated. Influence can be a tricky term to pin down, which is only complicated by its highly subjective component. A skeptic might look at any list of so-called “online influencers” and dismiss many of them as more competent in gaming the online influence system than anything else. Whether or not you completely buy into these new notions of influence, it is hard not to acknowledge the role these influencers play in disseminating information through their networks. It is with this in mind that I updated my Fintech100 list that was compiled back in late 2015 and replaced it with a larger list of #fintech influencers that we need to pay attention to in 2016. The new list of 250 fintech influencers is based on a larger sample size of almost 7,000 online identities using the Little Bird software engine. I have also filtered out the individual identities from the business identities based on the Twitter account segmentation into “person” or “company”. You can view the list directly in Google Docs as well. The list is ordered by “Insider Score” which is a proprietary scoring mechanism of the analytics engine. Those at the top of the list are followed by more of the sample group than the others. 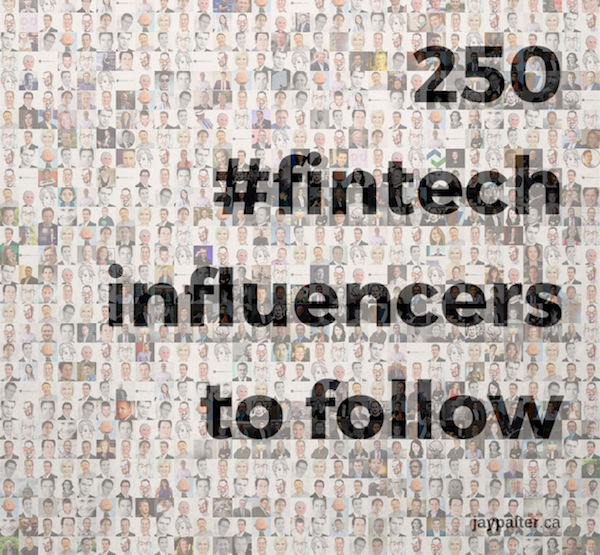 There is a tendency to focus on just the top 10, 25 or 100 people on lists like these, but that is in some ways to miss the forest for the trees.This list of 250 influencers and the larger group of 7,000 represents an important online community of people that are actively discussing issues related to #fintech.If you are an entrepreneur, a journalist, a startup investor, a potential customer of a startup, a potential buyer of a successful startup, an existing financial services business, a regulator, etc. (well, you get the picture) with an interest in the emerging #fintech space, then this is a very valuable group of people to be paying attention to – and to get the attention of. If you are interested in discussing influencer strategies and their benefits, don’t hesitate to comment below or send me a private message at jay@palter.ca. Insider Score is a simple count of the number of followers any other insider has from within the keyword-defined influencer group. Listening Score is a measure of how many of the keyword-defined influencer group are being followed by an insider. Emergence Score is a measure of how quickly a handle is emerging as an insider. Happy to be featured on the fintech list. Thanks a lot! So, a list of people that don’t actually run live Fintech businesses but just spend the day tweeting, twittering and self-promoting! Is this still based on use of the hashtag #fintech? The keyword I use to develop the report is “fintech” and #fintech” so use of the hashtag would play a role in identifying key influencers. Damn didn’t make the list this year…next year will be my year. Seriously Jay thanks for posting…it is good to know who are the influencers, disruptors, and thought leaders in #fintech.